As with all of the other corries on Beinn a'Bhuird, this secluded corrie is well worth a visit anytime of year. The corrie is often ringed with cornices throughout the winter and well into spring, but there are gaps, and it holds snow well, as with the other east facing corries nearby. The corrie is split into 2 lobes, separated by a rocky promontory. The rocky Dividing Buttress separates the southern lobe from Coire an Dubh Lochain, and this face has some shallow runnels that look interesting. The northernmost lobe peters out towards the streamline descending from Cnap a' Chleirich, which offers an easy return to the plateau. Alternatively, you can climb up the promontory, staying in the snow runnel on the north side of it. It is basically Grade I, but quicker. The main picture to the right shows the wealth of options available for descents in either lobe of the corrie. The approach up Glen Quoich is the most direct, but means the shortest route back involves an ascent out of the corrie which may result in a longer outing. The Gleann an t-Slugain approach is the most logical, and if conditions allow, you could cycle to within 3km of the corrie. 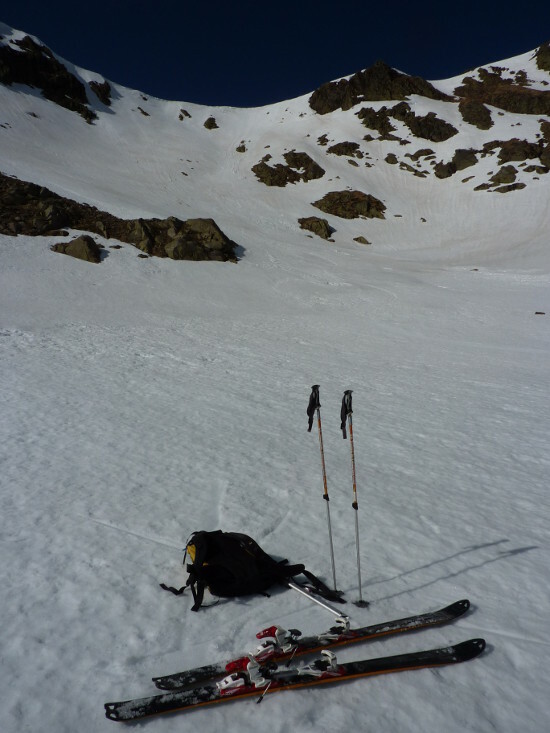 Naturally, if snow cover allows, you should be able to descend at least some of the ascent below the corrie on ski. 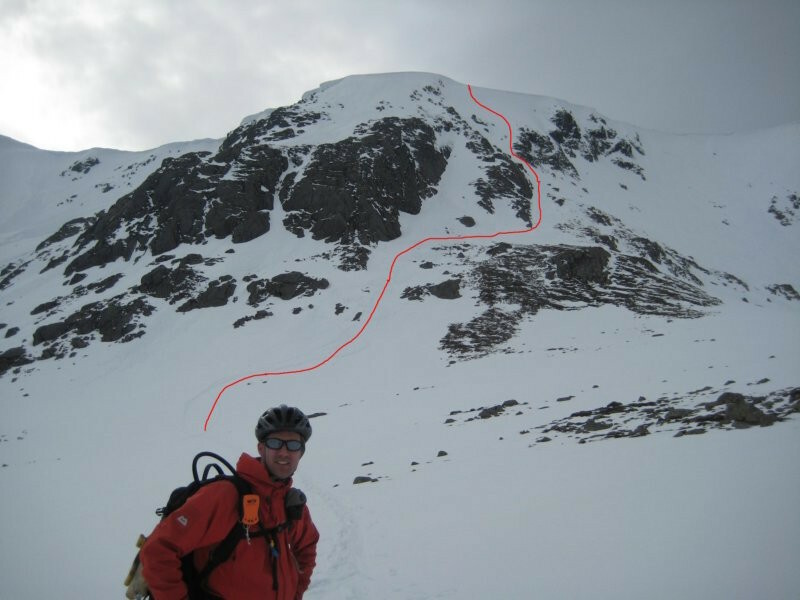 There are 2 Scottish Avalanche Information Service forecasts worth considering for Beinn a'Bhuird: Coire nan Clach. This can often be the only cornice-free section of the corrie. Facing south, it softens in the sun, so a decent run to do in the spring after a frosty night. Notes: Short steep section at the top. This descent takes the slope on the north side of the rocky promontory that divides the corrie into 2 lobes. This area can sometimes have a reasonable break in the often sizeable cornices ringing the corrie. Once on the upper slope, it's a case of ensuring you head for the shallow gully half way down the slope. From the exit of the gully, you can traverse skiers right towards the promontory and then descend, or head back into the corrie on skiers left. The headwall at the back of the North lobe of Coire Nan Clach often sports a huge cornice, but it can be smallest where the corrie rim turns Northeast, next to a rocky outcrop. As with the other corrie runs here, the top is the steepest section, then easy skiing to the corrie floor follows. There are several option here for a descent, and it really is a case of finding the smallest cornice. There are at least 3 obvious lines in the back wall, each defined by short shallow rocky ridges. The entries to each will usually be easiest at the Northern end of each of the entry points.